Are you making mistakes with your email marketing? I often see entrepreneurs and small business owners struggling with their email marketing. In fact, I have found that most of the business owners that I speak with have several of the same struggles, beliefs, and are making similar mistakes. As a digital marketer who is a master strategist and a professional content writer, it is my duty to know in the ins and outs of digital marketing and how content plays a role in it. Here’s the thing, content marketing literally touches every facet of digital marketing. How so? Let me explain. Content marketing is part of social media posts, email marketing, videos, blogs, public relations, and more. Content can be delivered via audio, video, graphics, or text. The choice is yours! Therefore, you can see that content marketing is very much part of your email marketing strategy. Maybe you’re new to the business world or perhaps you're a seasoned business owner, either way, I want to take just a few seconds to explain what email marketing is just in case you aren’t sure what I am talking about. Email marketing is the act of sending a message to a group of people using email. It’s a pretty simple definition but I often experience the look of confusion when I talk about email marketing. Examples of email marketing are the promotional emails you signed up for from Target® or Kohl’s®. The newsletters you receive from free digital downloads you snagged or even emails from your local movie theater announcing the movies for the week are all email marketing. This isn’t a full extensive list but it will at least help you understand the various types of emails you can send or receive that’s part of email marketing. As a seasoned digital marketer, I am a huge fan of email marketing. There are loads of benefits to utilizing it for your business. However, I only want to discuss with you briefly five of my favorite benefits so that you can fully understand how important it is to use with your digital marketing strategy. Automate your sales process - Sales can be made on autopilot 24/7/365. It reduces the amount of manual work you need to do to move a prospect from being a cold lead to a buyer. There’s only so much time in a day and by automating a portion of your sales process it’ll allow you to focus on serving your clients and hit your sales goals with less hustle. Develops relationships with potential clients 24/7/365 - Just like with the sales process, you can nurture and build relationships around the clock. Essentially you are romancing and wooing your audience and moving them through the customer value journey process from a cold lead to a buyer. Reach more people at once - With a push of a button, you can reach the masses without dealing with the algorithm. Even if only 25% of your list opens the email, you are nurturing warm leads who have taken the next step to move off of social media onto your list. They’re closer to the buying process and need your personal nurturing to convert. Positions you as a credible expert in the industry - People who subscribe to your email list see you as an expert in the industry. They’re coming to you for support, advice, training, etc. They want to learn from you. Having a list where you are able to send personalized and segmented emails to your list, allows for you to reach them where they are and guide them to where they want to be with your expertise. Easy to track and measure - Simply put, what you measure will grow. Tracking and measuring the performance of your email marketing strategy is simple when you are using an email service provider, like ConvertKit. It allows you to easily identify what is or isn’t working so that you can obviously do more of what is working. This will, in turn, help you create content for your blogs, social media, livestreams, and future emails. Now that you have learned more about what email marketing is and its benefits, it’s time to discuss the common mistakes entrepreneurs and small business owners make with their email marketing. If you are making any of the five common mistakes, don’t fret! You don’t know, what you don’t know. Therefore, take what you have learned and apply it to your email marketing strategy. And of course, if you need help with your email marketing, I’m just an email away. Feel free to shoot me an email at kayla@kaylabrissi.com. Email marketing isn’t for their business - Some business owners believe that only certain business types or industries can utilize email marketing. This is 100% false! It doesn’t matter if you’re an author, a coach or consultant, a brick and mortar boutique owner, a salon, a dentist, or even in MLM. ALL business types across ALL industries can leverage email marketing as part of their marketing strategy and in my professional opinion should be using it! Emails are sent sporadically or not at all - Having an email list is important but consistently providing value and nurturing the relationship is vital to the success of your email marketing strategy. You can’t expect to build relationships and drive conversions if your correspondence is sporadic or non-existent. Create a plan of action and stick to it! Emails are only promotional - Unless you are Target, nobody wants to get spammed with promotional offers constantly. It is important to provide an insane amount of value to your subscribers by following a 80/20 rule of thumb for content. Meaning, provide value 80% of the time and promote 20% of the time to your email list. Emails lack a clear marketing strategy - Most businesses don’t create an email marketing strategy that is designed to nurture their audience, build a community, generate leads, and drive conversion. They basically are “throwing spaghetti at the wall” hoping something will stick. This isn’t a well thought out strategy. Sure you might see some results but it’s not sustainable. The growth of your business requires a foundational marketing strategy that includes content, social media, and email marketing working together to increase your online exposure, provide value, build community, generate leads, and drive conversions. Looking for resources to improve your email marketing? Join my F-R-E-E Subscriber Tribe to gain access to my incredible Resource Library that hosts 20+ resources to help you in all areas of your business, including a fill-in-the-blank template for subject lines, 45+ ways to grow your email list, and 50+ ways to get insanely visible to generate leads for your email list. Join the Subscriber Tribe Resource Library today! Well, my friend, that’s it! Hopefully, you learned a bit more about email marketing and determined if you’re making any of the five common mistakes. 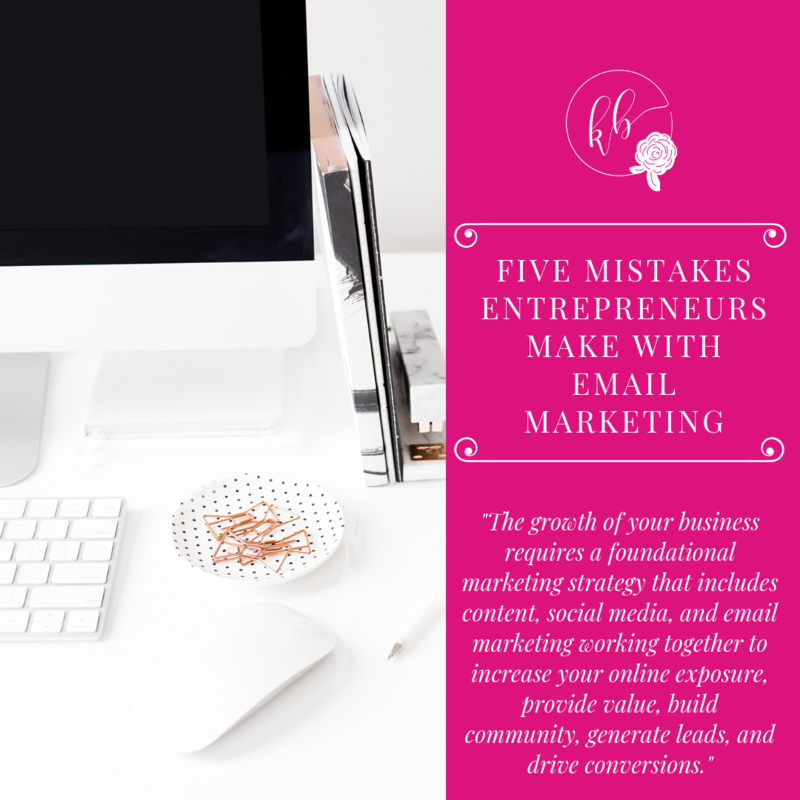 Because I am curious, share in the comments: What mistakes are you making with your email marketing?